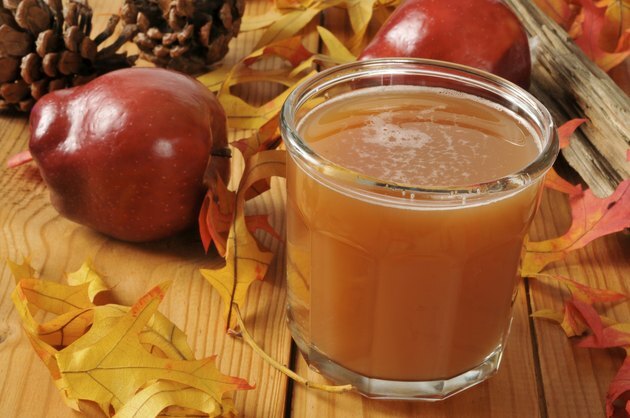 Apple cider is made from the juice that is extracted from the pulp of pureed apples. While it has its own health benefits, apple cider can also be made into apple cider vinegar, which is used as a cure for some health conditions. Apple cider vinegar is made from fermenting apple cider. Apple cider contains bacteria and acids that have shown a vast array of health benefits. Normal dosage instructions for apple cider vinegar is to mix 2 tablespoons into a glass of water and drink 3 times per day. Apple cider vinegar is the only kind of vinegar that is used mainly for health purposes. Like apples, apple cider has many health benefits. The health benefits of apples and apple cider come from the fruit's phytochemicals. Phenolics, flavonoids and carotenoids from apples may play a key role in reducing instances of some chronic diseases, according to a study published in the May 2004 issue of "Nutrition Journal." People who consume apples regularly in the diet are at lowered risk of cardiovascular disease, asthma, diabetes and some forms of cancer. Apples are also a source of antioxidants, which protect the body from damage caused by free radicals in the environment. Apple cider vinegar is a strongly alkalizing substance that helps digestion, especially in those people who do not produce enough hydrochloric acid in their stomach. When taking apple cider vinegar for help digesting acidic foods, such as meat, dairy or beans and nuts, it is suggested to take the apple cider vinegar before consuming the foods. Apple cider vinegar is also used as a natural cure for both constipation and diarrhea. It is able to help ease constipation due to its pectin content, which is a soluble fiber assisting the bowels in collecting and excreting waste. In the case of diarrhea, it is able to help by soothing the irritated lining of the intestine. The results of case studies and the personal anecdotes of many people trying to lose weight have shown that it does work for weight loss. It has been stated that some of the bacteria and acids in the apple cider vinegar may help speed metabolism, however, more research is needed in this area before conclusive evidence is found. Apple cider vinegar can work to adjust the pH level of the skin of a person who is taking it regularly. Since this reduces the number of odor-causing bacteria, it eases body odor. Apple cider has worked for some from the inside-out after prolonged use, and for others, applying diluted apple cider vinegar directly to the skin of the armpits or feet has proven to reduce odors. Although apple cider vinegar has not been proven to cure diabetes, it has been shown to provide some relief from the disease because some natural components of apple cider vinegar are able to help slow and control the rise in blood sugar after a meal is eaten. In combination with a sensible diabetic diet, apple cider vinegar can help alleviate some of the symptoms that accompany this disease such as fatigue, weakness, unquenchable thirst and frequent urination.